The ghostly white whale passed ominously under the ship, gliding tormentingly through the deep blue water of Pebble Beach with nary a care for the lives and aspirations of the insignificant creatures above. This whale, this white giant, this elusive phantom had passed under Captain Phil’s boat before…six times before but had never dared to venture this close, with this much disdain for him or the grey iron harpoon clutched in his left hand. Poised to strike, Captain Phil hurled the great spear at the body of the whale as it carelessly breached the calm surface, and it was with this blow that Captain Phil, finally, tasted blood. What is it that finally drives someone to madness? According to the American Psychological Association President Philip G. Zimbardo, Ph.D., not much. “Just about any ordinary person can slip into madness. In fact, all it may take to trigger the process is a special kind of blow to one’s self-image to push someone over the edge of sanity.” Phil Mickelson must possess a unique mind in order to have shielded himself from the inevitable onslaught of babbling madness that would come from six runner-up finishes in the U.S. Open. The only person who could possibly empathize with Phil about his U.S. Open tribulations is Apollo 13 astronaut Jim Lovell. He flew so close to the moon that he could see firsthand the imperfections on the surface, the way the rocks were positioned and the craters from ancient impacts with enough detail that he could knew what it would feel like to walk on it yet, he never did. If Phil and Jim haven’t gotten together to have a beer over a deep discussion on what it truly means to yearn, they should. Coming so close and then having it slip away time and time again on such a grand stage would surely melt a lesser mind, but not Phil’s. No, Captain Phil remained ever vigilant at the bow of his ship, scanning the horizon and waiting for his old nemesis to appear again, and when it was made known that the U.S. Open would be at Pebble this year, the wily old captain pulled every trick from his bag and struck a decisive first blow at the AT&T Pro-Am. After Mickelson’s inspired victory at Pebble Beach this last week, the U.S. Open venue showed its tender underbelly and revealed that it can indeed be conquered. Mickelson took full advantage, striking Pebble and Spyglass with a barrage of deadly putts and a three wood out of the trees that was so pure, it sent shivers down to the very depths of the sea. Mickelson’s 44th win at the AT&T Pebble Beach Pro-Am was a clear message to his white whale that its days are numbered. Phil would become the sixth golfer in history to win the career grand slam and he could finally sleep soundly, no longer tormented by visions of the three-putt at Shinnecock or his wayward drive at Winged Foot. It would seem that Phil’s maddening pursuit of his destiny has finally come to a tipping point. The final showdown is imminent and rest assured, one of them isn’t coming out of this alive. Phil Mickelson, at 48, has just ensured that this will be one of the most exciting and widely watched U.S. Opens in recent memory. Along with his chase for the career slam, there’s one more storyline that might be of interest to everyone: the resurgence of Tiger Woods. One wonders if Tiger willed himself to start playing at the highest level again simply to deny Phil his long sought after U.S. Open trophy. Tiger certainly isn’t the sentimental type and you better believe that the thought of stepping on Phil’s head one more time is only going to make him play that much harder. Dare we dream of a Sunday showdown at Pebble Beach between Tiger and Phil? Is the world even prepared for something like that? Dare we dream? Dare we? While that particular Sunday would answer the prayers of every golf fan on earth and bring a dollar sign shaped tear to the eyes of the money-men at Fox Sports, let’s not forget about the rest of the PGA tour. The tour is the deepest with talent it has ever been and every year it only gets deeper. This is why if Phil is going to kill, stuff and finally mount this thing on his wall, it needs to be now. Lest we forget that he needs to best that Dustin Johnson guy, or that what’s his name Justin Rose or that other Justin…Thomas or Rickie or Rory or Tony Finau or David Law, Cameron Champ or Branden Grace. Jason Day and Bubba, Paul Casey or any of the other galactically talented players that comprise the PGA and European tours. What if one of the dark horse qualifiers breaks through with a Friday 63 in the style of Roy “Tin Cup” McAvoy? What if Paul Stankowski shocks the world with a blistering four day total of 265, shattering the scoring record and making whoever bet him to win very, very rich? It’s anyone’s game this year but, every now and then, the planets align in just a certain way, the waters become very clear and from hell’s heart, Phil stabs at thee. 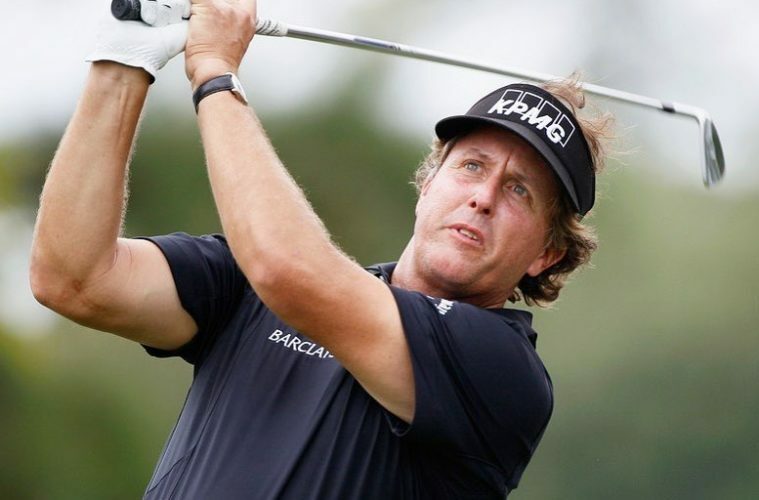 Is 2019 the year of Mickelson? We will just have to wait.